Germany, August 1992. The quest for steam (as they say). 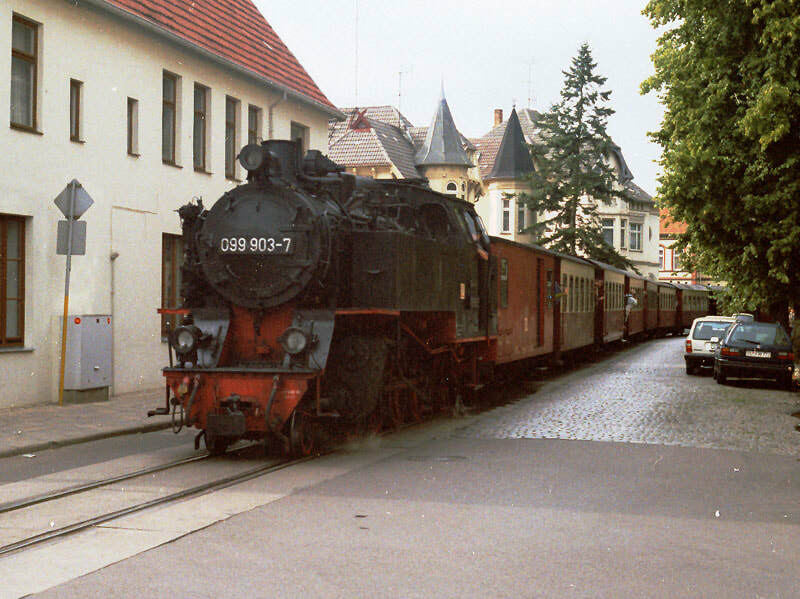 2-8-2T 99 903 makes its way cautiously along Goethestrasse in the centre of Bad Doberan, heading south towards the DB station on 16.8.92. ​urious photting of this and 1638 ex BD which was chased to Heiligendamm where it crossed 1635 ex Kühlungsborn (2-8-2T 99.903). Chased this back to BD for a final phot (and ran out of film). Thence to Rostock which has interesting 3 car tram sets with 4 wheel trailers. 2 orbits of city centre before stopping to ask two locals where Congress Hotel was. Third time lucky - it isn't in Rostock but half way to Warnemünde on the other side of the river. Finally found it, well peeved [with the travel agent, who had thoughtfully provided a map of Rostock city centre] but eternally grateful for high precision directions in halting English from the local residents. Mad dash back to BD for 1937 to Kühlungsborn behind 99.903. Much thrashing up the hill out of BD and out of Heiligendamm - very exciting from the front verandah. Light lasted as far as Heilgendamm so lots of phots in the street section. After the climbing, a gentle drift down to the coast. The engines are worked hard and caused mutliple fires on the afternoon trips attended by a road-borne squad of beaters who further held up traffic already slowed by drifting smoke. At Kühlungsborn West 99.905 was on shed - too dark to phot unfortunately. Telephone obeyed the [then] current standard of approximately 100 empty boxes for every one containing a telephone. Presumably DT is updating. Afternoon trains were full and standing, but only a few passengers on evening trip out. Fare of DM4 for 30km (£1.40 for 19 miles) seems a bargain. Train consisted of 9 bogie vehicles plus brake, seating capacity 288. Return trip (2051 ex K'born) was carrying almost all locals. Stopped at a remote halt in the middle of a field but still had one passenger. Back to the 50s! A marvellous day, ending with a trundle back to Lütten Klein in the car. Very good buffet breakfast at 0600 sharp. Away by 0630 for a dreadful journey to Putbus, improved by a stop to phot 3-car Rostock tram set (not an artic unfortunately) but made worse by apparently pointless 15 minute delay in Stralsund. Noticed some interesting large brick warehouses in Rostock's dock area, with tall pointed roofs. All major churches on the Baltic coast seem to be brick too, some very large. Just like the old days, and it was even raining. 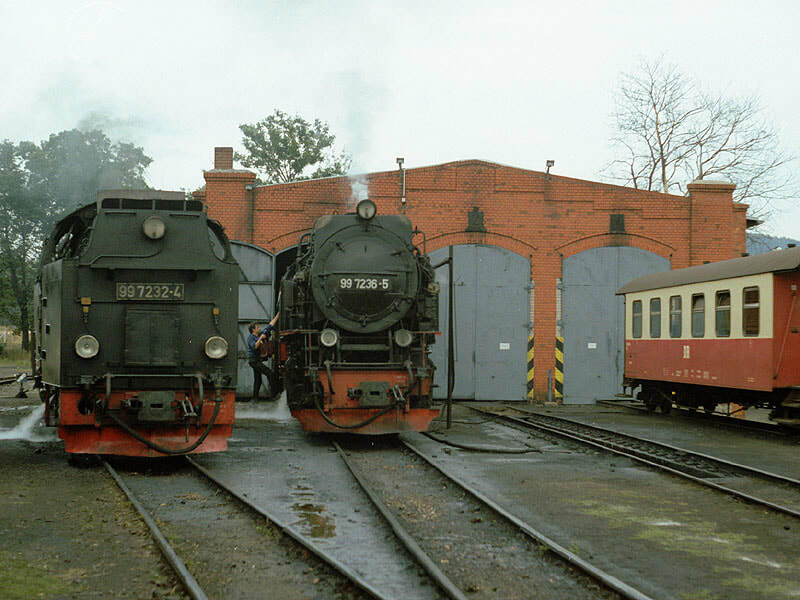 99 780, 99 748 and 99 746 on Putbus shed, 17.8.92. Putbus extraordinary - a huge 'circus' which would be Georgian if in England, with a monument in the centre, and a very tatty little town around it. Found the station thanks to a map and was able to bring back old times by bunking the shed in the rain (2-10-2Ts 99.780 and 99.748, the former in steam, and 2-8-0T 99.746 also in steam). Then off to Binz Ost to watch trains cross. All sorts of wallies getting in the way, not least the one with the minibus who blocked the car in. Having extracted it, off to Sellin with a view to riding to Göhren but (due to a misleading map) couldn't find the station. Eventually found it but was refused ticket by the booking clerk on the grounds of imminent departure. 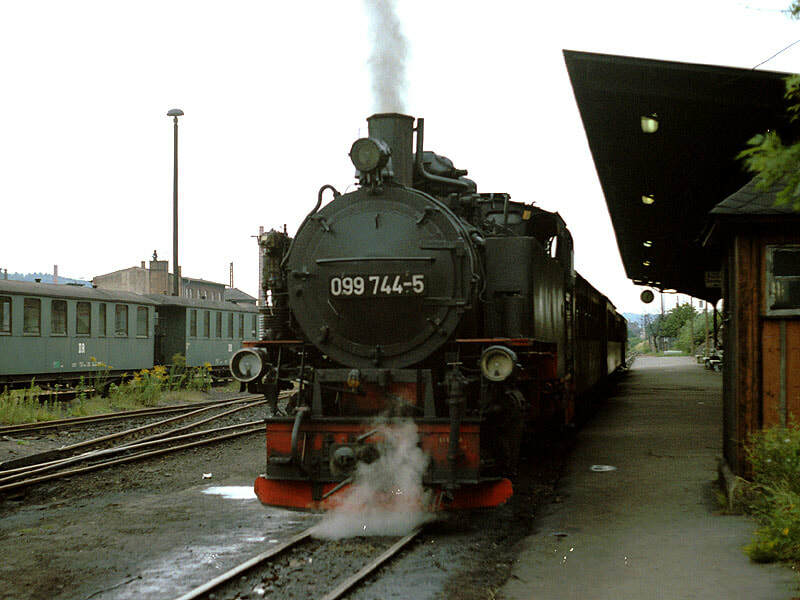 Settled for photting at Göhren (severe slip - forgot to look in the shed) and hopefully good action shots [they weren't anyway - and on grainy cheapo film the negs aren't scannable, sadly] coming up the bank from Binz to Serams (2-10-2T, chimney first). A Milanese taxi driver appeared here, also standing in the rain in a field photting. All this followed by memorably awful trip to Wittenberg (a whole hour to get into Stralsund this time, again for no apparent reason). Wittenberg possibly the most depressing and down at heel town I've ever been in [but it isn't now, see my May 2000 visit]. Hotel out of the 40s (being generous). Lino on bedroom floor, holes in doors; altogether frightful except for the staff who couldn't have been more pleasant. A tour of Wittenberg failed to produce a phone which worked. Subsequently discovered UK code from here to be 0644 not 0044; reason unknown but day saved by the hotel receptionist. Between motorway and Wittenberg is Coswig where the paper mill has a short branch and possibly a steam loco. The whole journey took almost 71/2 hours less about half an hour for various petrol/steak/R&R stops. Motorway caff was much better than the motorway! 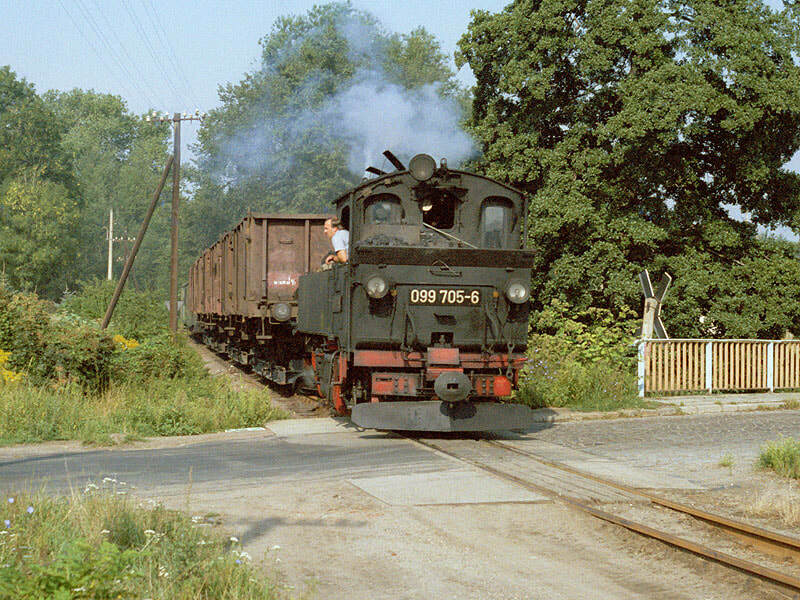 0-4-4-0T 99 705 approaching Oschatz with standard gauge wagons on 750mm gauge transporter wagons. 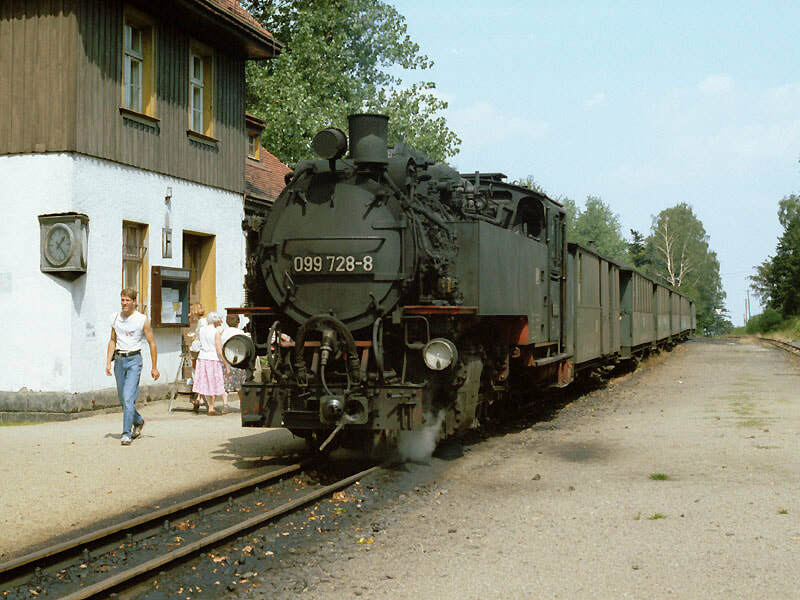 This traffic lasted until 2001, latterly diesel hauled, and was the last narrow gauge freight branch in Germany. Depression City looks much better under a cloudless blue sky after an excellent breakfast. Off to Oschatz supposedly. An excellent run for the first half then all sorts of oddities including about 5 miles of rural pavé. Diverted 3 km from Oschatz due to bridge closure then no signs whatsoever so back to Riesa and down the main drag until -shock, horror - diverted 1 km from Oschatz for some other reason. Gave up the unequal struggle and headed for Mügeln only to go over a level crossing and see a train about half a mile away. Next parking place 200 metres - ran back in a time which would do Linford [Christie] credit. Then camera malfunctioned due to lens being shaken loose. Dash back to car, pursue train. Scream past it, into under-construction garage forecourt, charge across newly dug garden, just get a shot. Builders look on serenely - must be used to it. Pursue train again and finally get a decent shot at a crossing on the outskirts of Oschatz. Into town (beat the roadworks by using back road) to arrive at the station before the train. Excellent view of the n.g. yard over a low fence so much photting of the Mallet shunting. Asked 'the man' when it would go back and was told a few minutes. Fortunate I asked, as it went rather quickly, engine and brake. Just able to phot it on the mixed gauge section and various other locations. Found the shed at Mügeln, containing another Mallet [Sachsen-Meyer I think in fact] and bunked it in company with two Dutch and three German enthusiasts. ​Satisfied with this, decided I could just make Radebeul for the 1217 and so it proved after a mad dash down the motorway. 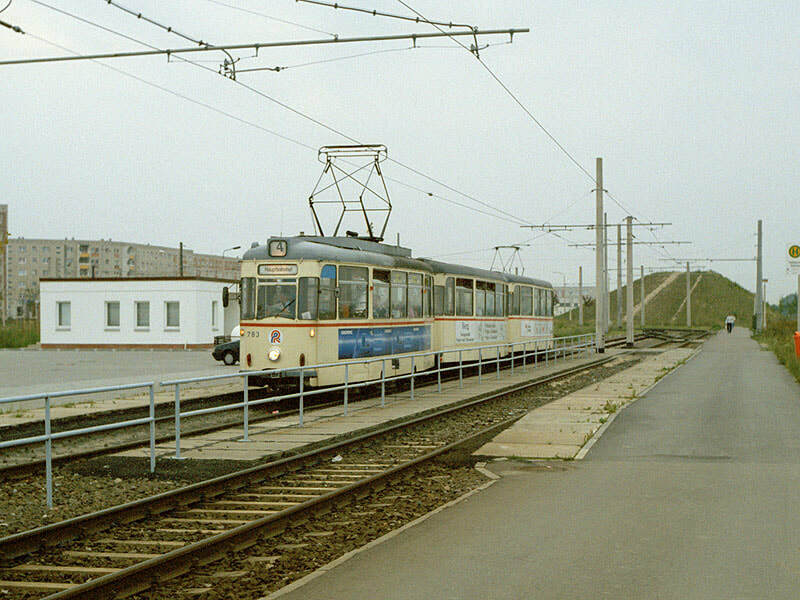 1217 was photted crossing main road and tramlines at Weiss Ross. Chased up to Moritzburg just in time to catch it crossing 1217 ex Radeburg. 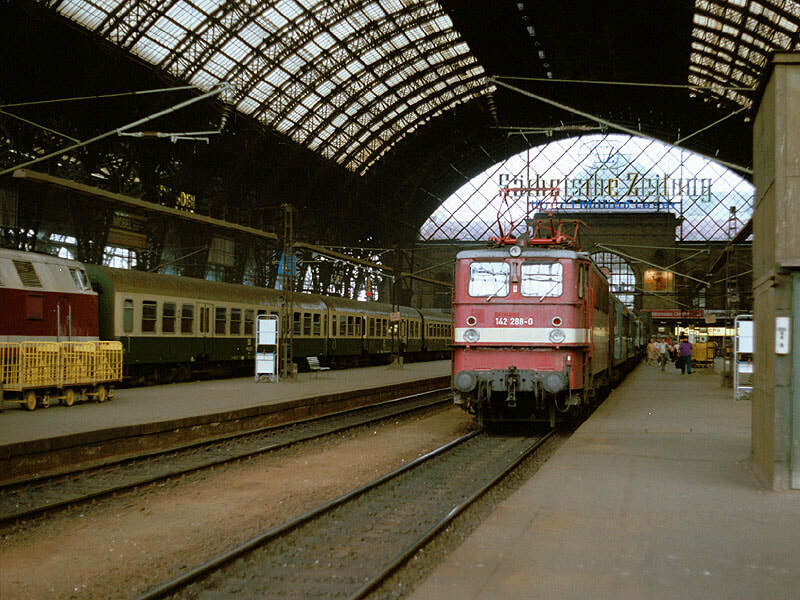 This part of Dresden Hbf still looks similar but the trains have long gone. 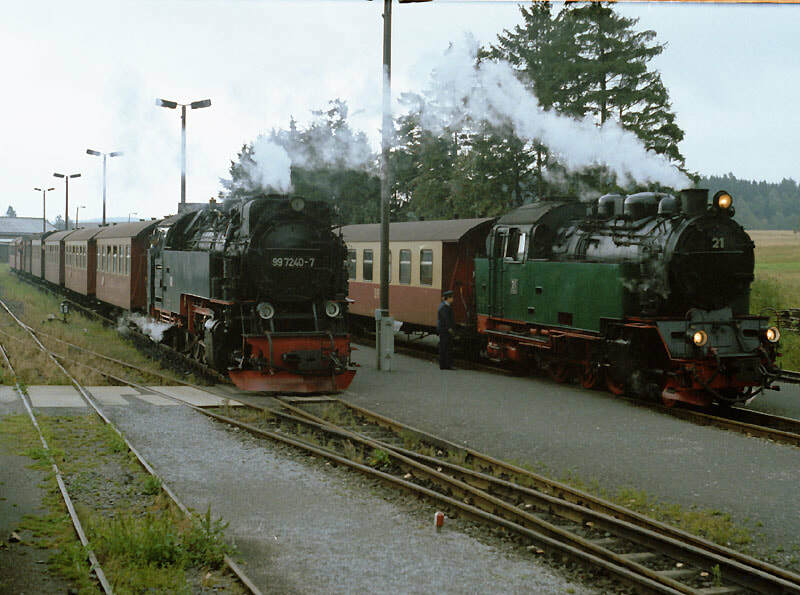 On the right is electric 142 288 which hauled my local out to Freital-Hainsberg on 18.8.92. 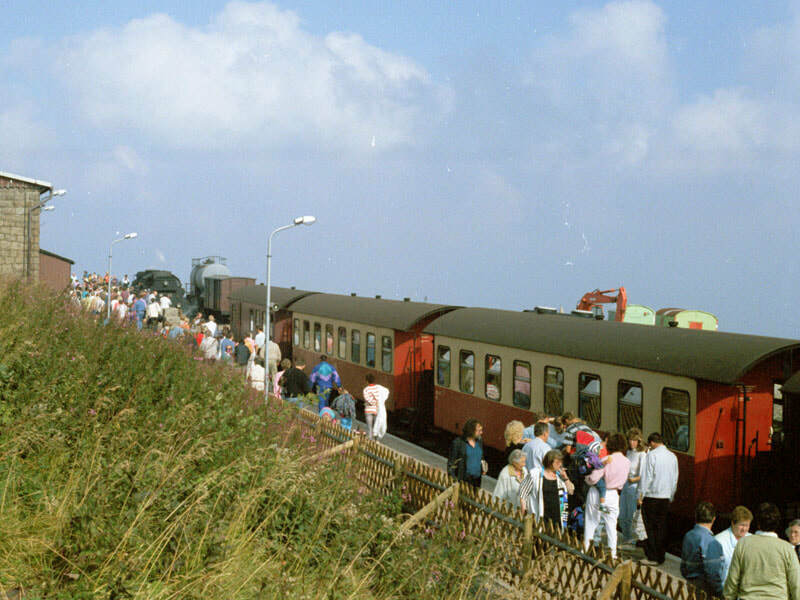 On the left is an unidentified diesel-hydraulic with ex-DR main line coaches still in their green and cream DR colours. 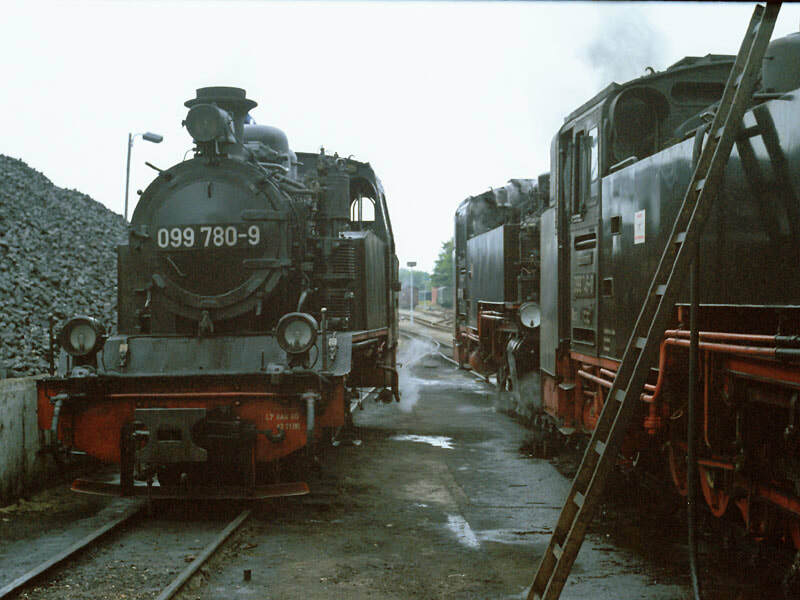 Right : 2-10-2T 99 744 awaiting departure from Freital-Hainsberg on 18.8.92. I wasn't sure whether this was revenue earning freight - suspected (and still do) that this was an engineers' train with ballast in the s.g. wagons. 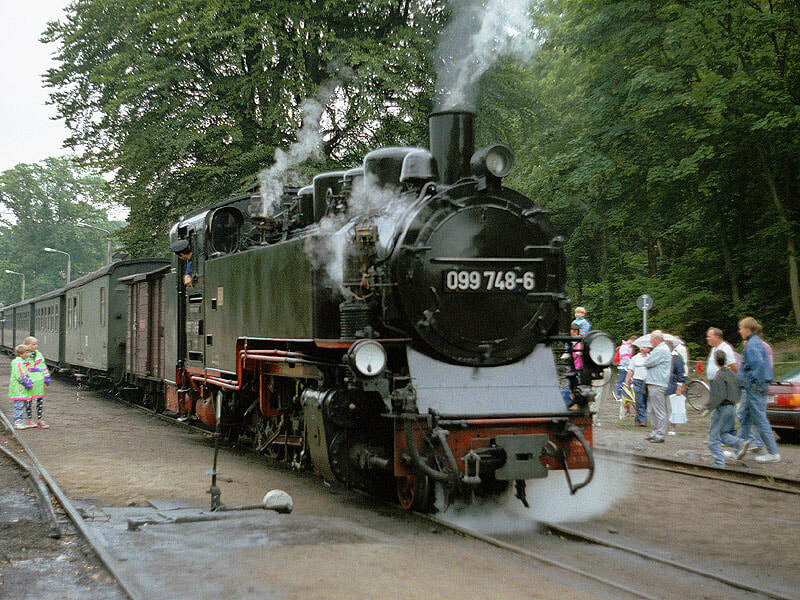 99 736 is the 2-10-2T in charge at Dippoldiswalde on 19.8.92. The usual excellent spread for breakfast, much enjoyed. Off betimes (0630) for Dippoldiswalde. Not a cloud in the sky at Dresden, torrential rain at Dippoldiswalde.Train duly arrived, station person muttering but reassured (I thought) when I said I was going to Kipsdorf. Down (the hill) train didn't appear - we set off up the hill. Waited at the next loop (sun out by now) - still no down train. At next loop much telephoning, loco ran round, crew managed to convey to me that there was a bus onwards. This not being of interest, eventually convinced them by waving car keys that yes, I really did want to go back to Dippoldiswalde. Thence back to Dresden and down the motorway to Bautzen. This is really, really awful even if you keep to the 100km limit. There is about 4 miles of one carriageway missing, grass grown and disused. There is a bridge missing so presumably it was bombed and never repaired. There is also a bridge missing at the junction with the motorway to Berlin presumably for the same reason. Main road (much better than the motorway) to Löbau where another of the legendary traffic jams put paid to a further 15 minutes. Finally to Zittau and on to Bertsdorf, a delightful country junction with everything except English speaking booking clerks [or German speaking passengers for that matter]. Bought tickets, amid some amusement, to Zittau, Oybin and Jonsdorf. Down to Zittau OK with 2-10-2T but on the way back the gripper spotted that my ticket was dated 16th and not 19th. Long and voluble impasse ensued during which he convinced me that my ticket was out of date, I convinced him that I was saying I had bought it that morning (which I had), and he decided I wasn't going to co-operate anyway. Continued to Jonsdorf where I invested a further 60 pfennigs to avoid a repeat performance. Back at Bertsdorf I found gripper and ticket clerk together, they assured me 'ist gut' and seemed to find it all very amusing. Brushes with officialdom finished, completed the system by riding up to Oybin (though very peeved to find that all three roads at Bertsdorf can be done). Finally tried for a photograph in the woods between Bertsdorf and Jonsdorf. Idyllic location with sun shining through trees etc., but inevitably 15 sec before the train arrived the sun went in (literally - it was out again 1 minute later). Returned to Zittau and Dresden chewing girders. Westbound motorway even worse with stretches of pavé, bridges like 'sleeping policemen', etc. It is simply not safe at the 100 kph limit. Settled down for an early night, abandoning earlier plan to complete Kipsdorf line on the grounds of a long drive tomorrow. 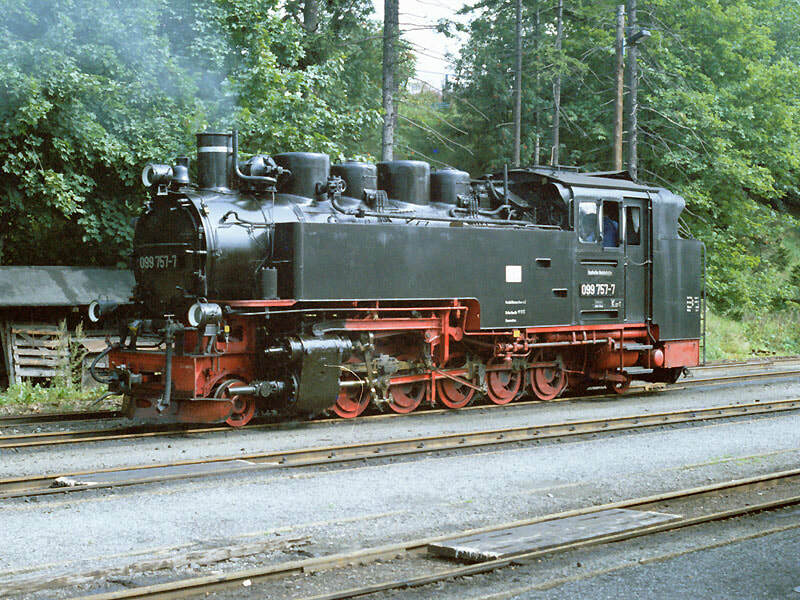 2-10-2T 99 757 at Oberwiesenthal on 20.8.92. Goodness knows where I found time to grab the photo. ​On then for a long slow drive back through Chemnitz and on up 95 to Leipzig. Whoever said 'use the motorway when possible even when it's further' was dead right but possibly hasn't been to Bautzen. Slight detour in Leipzig to look at the famous station [Hbf. - I didn't know about Bayer. Bf. then] which is grubby (except for new red roof) but very, very large. Further detour finding 6 to get to Halle on the off chance that it goes in near the shed (it doesn't). Half way to Halle, 6 is closed. No diversion sign. Try right - inevitably it's wrong. Try left, wander off all over the place navigating by the sun, eventually encounter other vehicles doing the same, which lead me into major road works with temporary lights but eventually back to route 6. Lost interest in locos by now so charged off through Halle on to 80 to Eisleben which, joy of joys, is a smooth dual carriageway.Uneventful the rest of the way to Harzgerode except for crossing a metre gauge-ish line just after joining 242. [Looking at a map later I thought that my eyes had deceived me, but it must have been the narrow gauge Klostermansfeld - Hettstedt line]. How I would like to have been sitting at one of those tables with a beer! 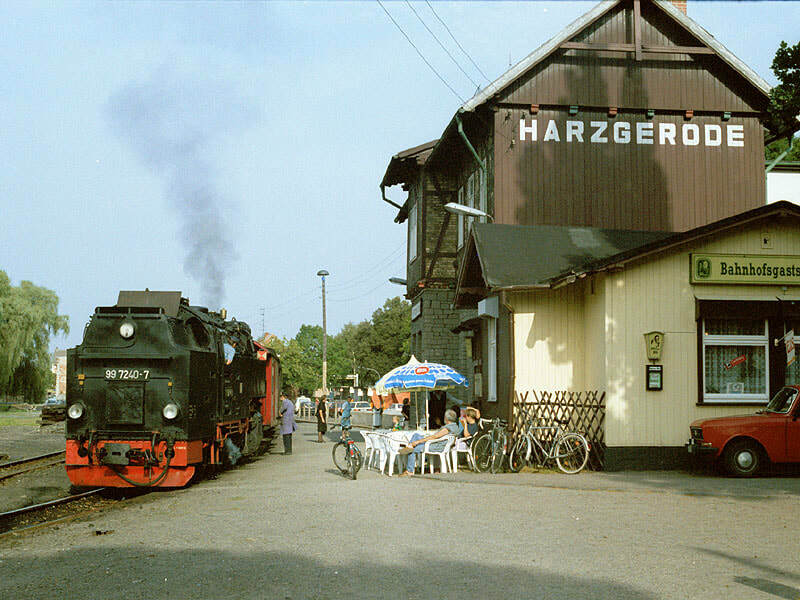 Alas, it was not to be and I had to content myself with this shot of the Bahnhofsgastätte - no, I mean, of 2-10-2T 99 7240 waiting at Harzgerode with the branch train back to Alexisbad on 20.8.92! ​After Harzgerode, dramatic improvement in scenery, with branch coming alongside and over road. Finally arrived in Alexisbad 4 mins before last train to Harzgerode so with help from amiable non English speaking staff, hurled myself on to this for a short ride up the branch. Beer break at the top but alas with the lack of time the car was still not at the hotel so none for me. [There was, and possibly still is, a zero alcohol limit in the former East Germany at the time]. Rode back down at 1817 (not 1810 as in the book). Drove to the hotel just in time to see the 2-10-2T go past en route to Gernrode. A very satisfactory end to the day. Dinner in Harzgerode (even broccoli in cheese seems acceptable due to lack of lunch). Phoning UK not possible. Huge thunderstorm 9 p.m. (see Thursday last year) with someone competing with fireworks across road. Just the steady drizzle this morning. Breakfast at 0630, off out in time to phot the first train of the day approaching Alexisbad from Gernrode and again on the bank up to Harzgerode. Thence to Stiege where the layout is very strange. The loop is used, and allows through running Nordhausen -Gernrode & v.v. Arriving in great haste I only glanced at the start of the loop and assumed it to be the Gernrode - Nordhausen junction. Totally disorientated therefore when the green 2-6-2T arrived from Nordhausen, however boarded with great trepidation upon assurances from loco driver and ticket clerk. 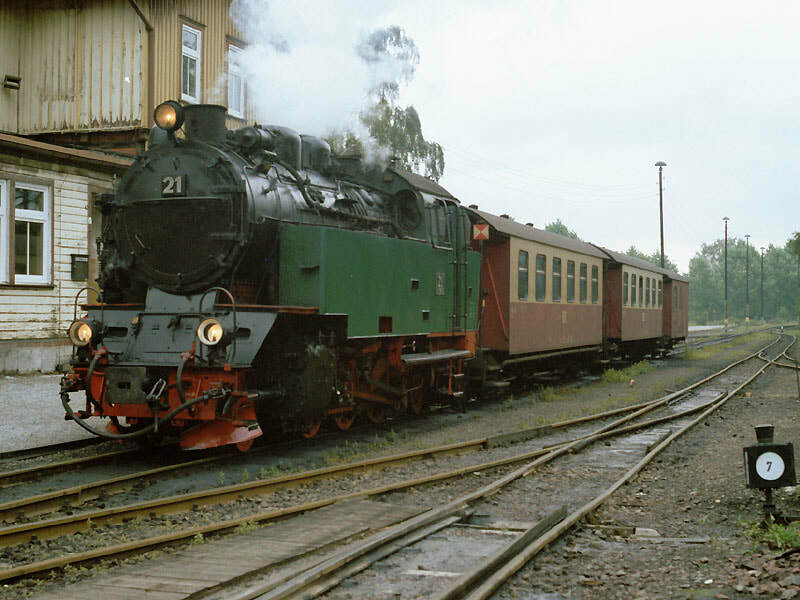 Left : 2-6-2T 21 at Hasselfelde, terminus of the branch from Stiege. Stiege on 21.8.92, looking south east. On the left, 99 7240 with a Nordhausen-Gernrode train which will shortly depart, run round the loop and head back through the station in the opposite direction. 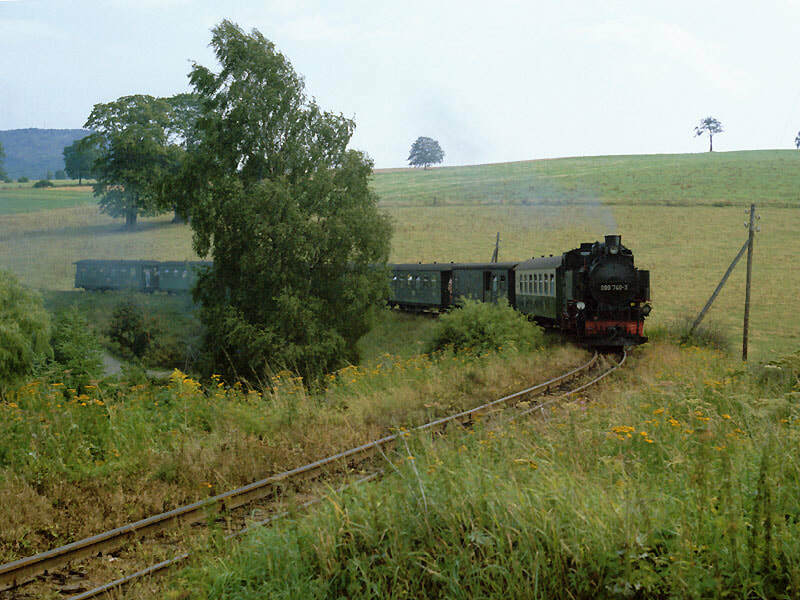 On the right, 21 on the Hasselfelde branch train which will go more or less straight there! Onwards by road to Hasselfelde and Drei Annen Hohne where an excellent phot spot was located, during which the opportunity to phot a Schierke/Brocken train was lost, the Nordhausen train was given up for lost and then passed on the way back to Drei Annen Hohne. Contact had been established with home at Elbingerode but Heathrow transport arrangements still uncertain. Cheesed off with Drei Annen Hohne, retired to Wernigerode on the grounds that at least there should be a shed to photograph. There was. Decided to chase the 1329 to the Drei Annen pub where (hopefully) phots were obtained as it struggled up the bank at literally walking pace. It stopped at the top but with 15 mins in hand before arrival at Drei Annen Hohne I assumed it was just for a blow up. Wrong. Proceeded to the morning's phot spot and waited 3/4 hour past the 1435 departure time. ​Thoroughly cheesed off by now, decided the rest of the day wasn't worth much effort so decided to phot the 1531 to Brocken. The ailing 1435 departed meanwhile behind some kind of locomotive not propelled by steam. The 1531 Brocken obliged me, 4 dutch, 2 Italian and one German enthusiast with a splendid display of clag. 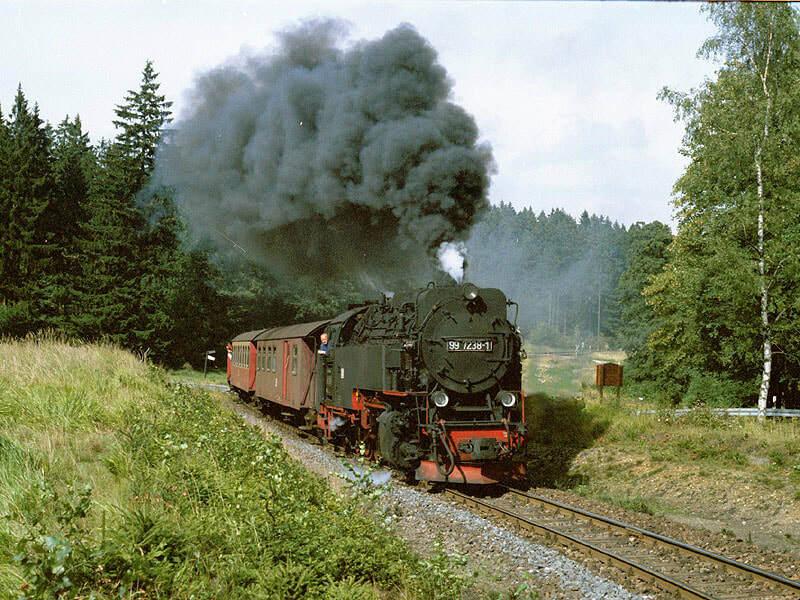 The next Nordhausen train, also steam, went at 1550 and while getting ready to leave a further Brocken train blasted out with a similar cloud of clag. Things were improving. 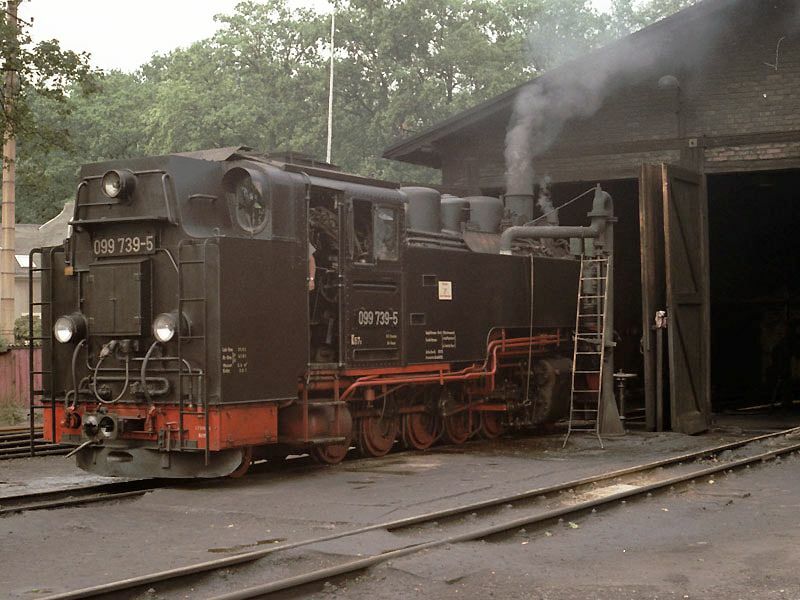 Two 2-10-2Ts on Gernrode shed in the evening of 21.8.92. The 0-6-0T is out of sight behind the left hand loco. ​Decided at that point to retire to Alexisbad with a view to photting 1741 to Harzgerode on the bank and possibly looking at Gernrode. 1741 was half an hour late so decided to phot it on the way back 10 minutes later and follow it to Gernrode. This was done, arriving in Gernrode about 15 minutes before the train having photted it once more en route. Gernrode turned out a gem which could have been any Z level sub shed of Newton Heath or Landore. As well as a 2-10-2T it contained a dead, but seemingly workable, 0-6-0T. Lots of sheddy phots then another 2-10-2T came on shed so a quick bunk to get a suitable phot. 2-10-2Ts fire was then dropped. Brief interlude with two class 202 diesels on the standard gauge before two final shots of the train from Harzgerode trundling through the fields across the road from the station. En route to Alexisbad had managed a lengthy, successful and for some reason free phone call to Shropshire, also photos of the dam and tunnel near Wendefurth. So the Harz came good in the end. Breakfast at 0630 for the last day, allowing me to get back to my room to phot the 0616 ex Gernrode passing the window! For want of anything better, chased it up to Harzgerode which provided good shots due to the cold morning. Well worth while as it turned out. Back to Alexisbad for a final lineside shot of 0700 ex Gernrode departing, then to Drei Annen Hohne again, to find that the couple of miles Schierke - Brocken costs DM24 return. Perhaps DR does understand pricing after all. 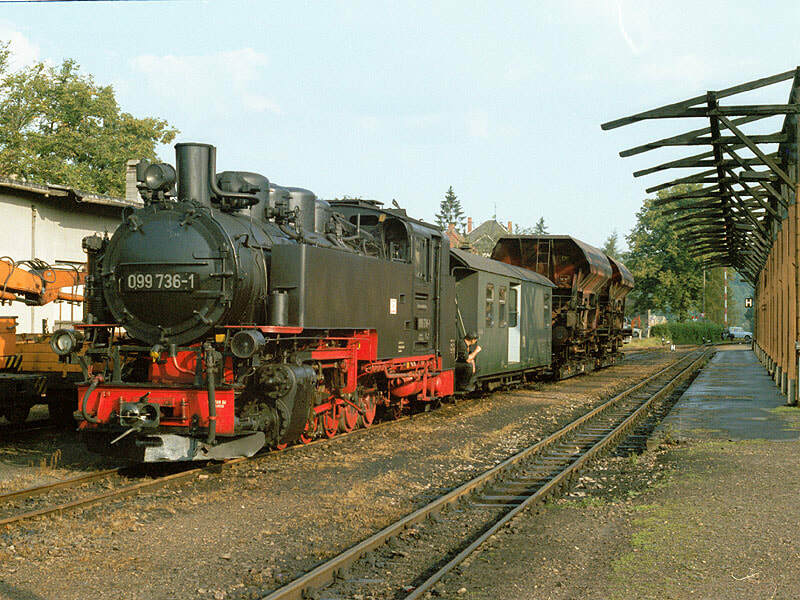 Yesterday's failed loco had been dragged away from Drei Annen Hohne but there were still 3 standard gauge coal wagons. A number of people were waiting for the train which arrived from Wernigerode wedged - fortunately I noticed two getting off, in time to get a seat. Very hard climb, at least for the first part to Schierke where there was cause for relief at the decision to get on at Drei Annen Hohne since there were probably 200+ waiting. All crammed in as far as I could see and we were away up to Brocken on time. 2-10-2T was worked hard but seemed well able to cope and arrived at Brocken on time. Heavily wooded line and standing passengers restricted the views but it was easy to know when to stand up and look from the chorus of 'aahs'. Towards the top there is a long stretch of 8 ft high wire mesh with support for barbed wire which has been removed. At the top there is radar, microwaves, television, military vehicles, etc., etc., - everything you would expect including a bar. Operating practice on the Brocken branch is not designed to appeal to people with planes to catch. Train was due off 10 minutes after arrival according to published timetable but local modification at Drei Annen Hohne suggested 20 not 10. In the event it was 40+, during which time a brewery-sponsored sonderzug arrived complete with very bad oompah band (who settled down to perform between the two trains, thus preventing mine from moving safely). Half way down we were shunted to allow another (diesel hauled) train past. Miraculously got to Drei Annen Hohne only about 1 minute late so confidence returned. Drei Annen Hohne absolutely shambolic, overrun by photters and persons wishing to travel. Managed a shot of 1149 to Nordhausen leaving. Drove down to Eland where it was just arriving, decided to carry on but encountered a rare road overbridge so used up my last phot on the 2-10-2T then bade it a sad farewell. I was staggered by the difference in 'townscape' on return to the ex-West. Just a line of fence posts à la Brocken at the actual ex-border. Fairly boring journey to Hannover enlivened by getting well lost in Braunschweig but seeing some more trams and a preserved DB Pacific on a plinth. At Hannover Airport the 737 sat on the tarmac for 30 minutes while Frankfurt Air Traffic Control found a slot for it, but otherwise the journey home was uneventful. As a result of this excellent exploratory week, supposedly a 'once in a lifetime' trip, interest was growing in all things Continental. I'd really enjoyed the week, and still remember it in great detail, but as a dedicated trackbasher and arguably the world's worst photographer, it was probably wise for me to make it the one and only car/photography expedition. The following April the Branch Line Society came up with a rail tour of Luxembourg, so the rucksack came out for some serious track bashing.